Let’s take total rewards as a great example of how efficient communication can totally change your employees’ mindset about what’s in it for them. When employees receive a paycheck, the number they see is what they get. In other words, they don’t have to process much to understand the monetary value associated with their work. On the other hand, when employees access their benefits program without clear communication regarding the advantages it carries, they often don’t realize that every penny the benefits program covers is a direct increase of their base compensation! 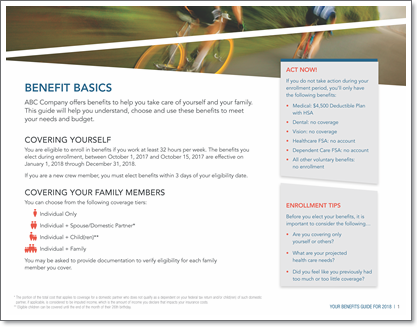 Educating employees and families about their benefits is critical. Here are some helpful guidelines on the best ways to do it. Communicating benefits programs can quickly drift to exhaustive explanations that will discourage employees even before they really understand their choices (e.g., they just keep the same medical plan they’ve had the past three years, even though their family has changed). The secret to success here is to have the details readily available, but highlight just key messages and required actions that correspond to the employees’ needs. Your communication tool should translate confusing and redundant information into a clear and relevant message, so employees immediately understand the WIIFMs. This will lead to intentional decision-making. The goal is not to share an in-depth amount of different information. Rather, it’s to share the key messages through various mediums and give the clear pathways to more detail when they need it. Keep in mind, targeting the right tool for the right content and the right audience is key (e.g., access to email vs. key messages via daily huddles). Employees need to be informed in order to choose benefits that best suit their personal situation. Whether that means using a benefits enrollment guide or other means of communication, it is your role as an employer to provide them with clear, accurate insights. The time and money you invest in effectively communicating your benefits enrollment program is nothing compared to what you can expect to gain from engaged, knowledgeable employees. Aka, your fans! PS: If you're feeling a bit behind the eight-ball on enrollment planning, you can get a jump start with our free and easy enrollment prep planning template. You'll find a ready-made structure for creating an overall game plan and critical task buckets. Product Development Director, Communication, The HR Trove by Willis Towers Watson Elizabeth is a seasoned consultant now combining eCommerce, communication, change management and marketing for The HR Trove by Willis Towers Watson. With over 30 years of experience under her belt she has been helping others across industries maximize opportunities and solve problems with creativity, innovation and hard work. And, she’s had fun doing it!